Main Street, from Florence to Chicago Ave.
Every September, a stretch of Main Street, from Hinman Avenue to Crown Park, is open for community, art, play, and exercise. 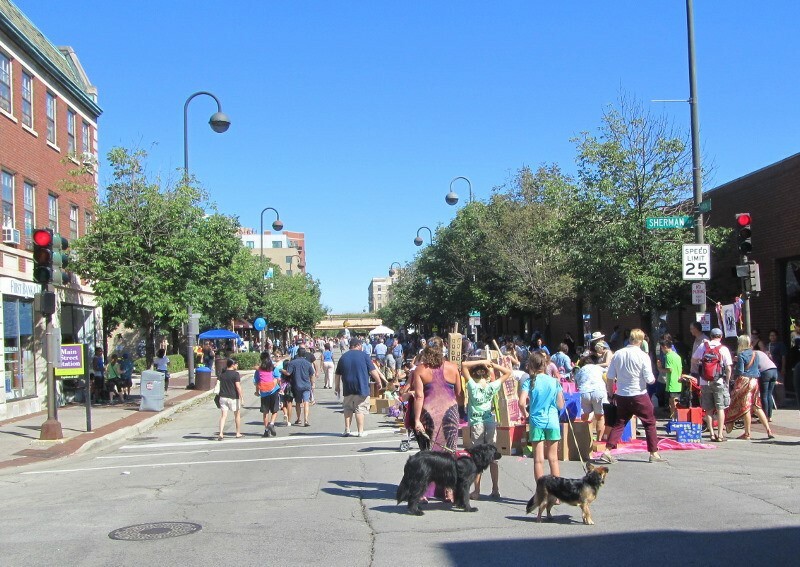 We invite everyone to enjoy Evanston’s streets and all the life and culture on display. Streets Alive promotes physical activity, local culture, and environmental awareness. It connects people and neighborhoods, and provides our community with a wonderful new experience of Evanston. 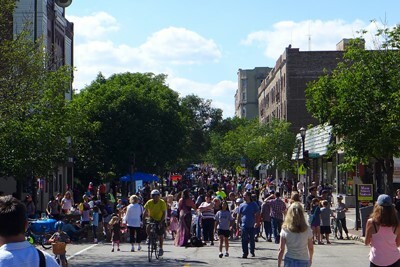 CGE is partnering with the City and the Evanston Environmental Association to bring the Evanston Green Living Festival to Main Street, in order to share a comprehensive environmental vision and tools with a wider audience. Every year, Streets Alive draws thousands of people. Evanston Streets Alive! is an open streets event, one of the most potent developments in the livable cities movement. Streets Alive creates new open space where Evanstonians can freely walk, bike, and play, and enjoy art, culture, and community. Livability means healthy citizens and a healthier environment for Evanston. Motorized vehicles are a major source of Evanston’s greenhouse gas emissions, and excessive motorized traffic contributes to lower air quality, lower quality of life and shortened life spans. Streets Alive and CGE’s other Pro-Walk, Pro-Bike, Pro-Place projects encourage a culture of greener, healthier transportation. These forms of active transportation improve health, reduce harmful emissions, and create a safer, friendlier, more vibrant public realm, which in turn encourages more walking and biking. Streets Alive also encourages the community to collectively reimagine and repurpose our precious public spaces. Although car-free streets are temporary, they help us visualize different ways to use these spaces, and they demonstrate the pent-up demand for permanently safe, complete streets and vibrant, people-oriented open spaces.